Juergen Jungbauer humbly says everything he’s touched has accidentally turned to gold. The German native’s expertise in making pastries took him all around the world on a cruise ship, brought him to America and earned him several awards against some of the world’s best chefs — all before the age of 26. Yet, his greatest professional achievement is likely his small German café and bakery in Lawrence. In 1968, Jungbauer, 75, known as J.J. to employees and regular customers, opened Heidelberg Haus at 7625 Pendleton Pike. Fifty years later, he still works in the store, but in a different capacity. 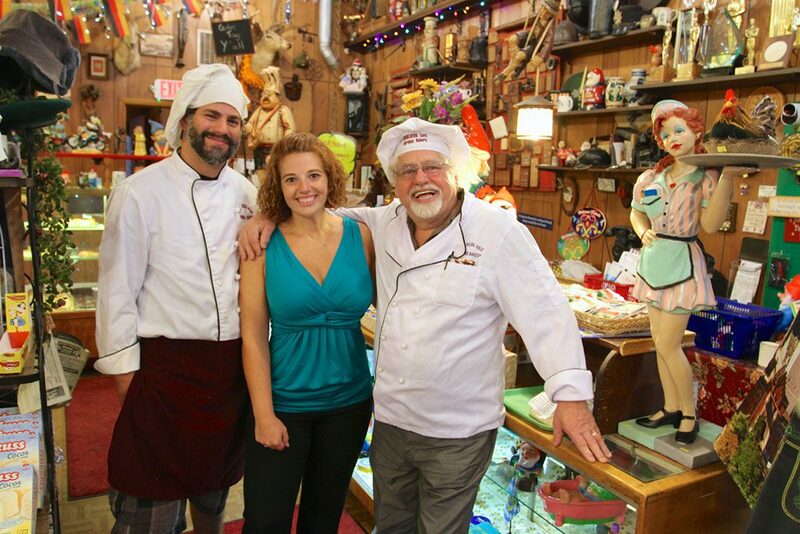 Angela Corkwell, the youngest of Jungbauer’s four daughters, now manages the business, and her husband, Charlie, operates the bakery. On the café side, the menu is small, with only 15 dishes, only a couple of which have changed in five decades. On the bakery side, the menu is anything but small. Dozens of varieties of pastries are made daily, filling multiple bake cases. A first time walk through the front door is an experience in itself. The main aisle inside the front door is lined with shelves of cakes and pastries to the right. 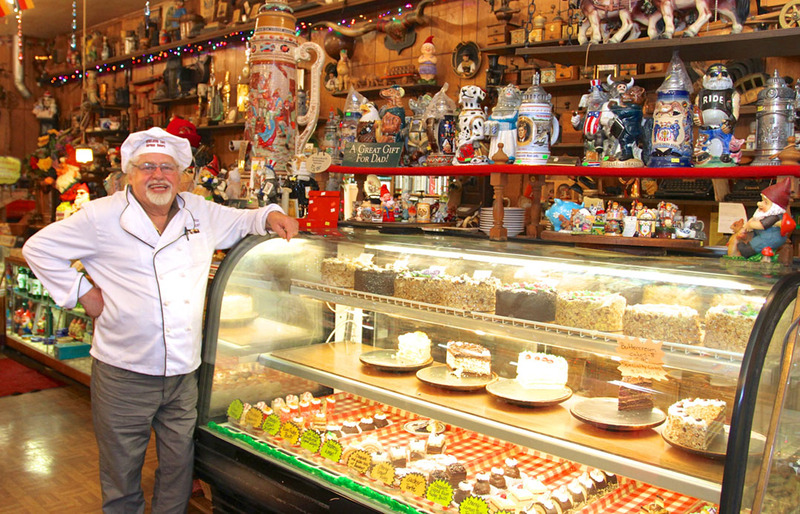 The cashier’s counter on the left is home to a large display of German chocolate and gnomes peeking out of every corner, thought to bring good luck. Every inch is covered with something, mostly authentic German souvenirs. Jungbauer, the son of a sausage maker. was born in Karlsruhe, Germany, near the German, French and Swiss border. He began an apprenticeship to be a pastry chef when he was 14. “My dad said, ‘Stay in the food business; people always have to eat.’ So, I became a pastry chef and decided to travel the world,” Jungbauer said. Daily trips checking in at a recruiting office got him his first job as a dishwasher on a cruise ship. He was promoted after one of the pastry chefs became ill. A year and a half later, a restaurant owner traveling on the ship saw see his work and invited him to New York City in 1963. He moved to Vermont 1 1/2 years later and worked for the von Trapp family. He then moved to California, where he was drafted into the U.S. Army and stationed at Fort Benjamin Harrison. Around that time, a new USO office had opened in Indianapolis. The chef there asked Jungbauer to make a cake, but he didn’t have any tools. His solution? To ask for help from a local baker that occupied the space where Heidelberg Haus now sits. Jungbauer said he planned to stay a year or two in America then go back home and say he had worked In America. Heidelberg Haus is open from 8:30 a.m. to 7 p.m. Monday through Friday, 8:30 a.m. to 5 p.m. Saturday and 11 a.m. to 5 p.m. Sunday. For more, visit HeidelbergHaus.com.